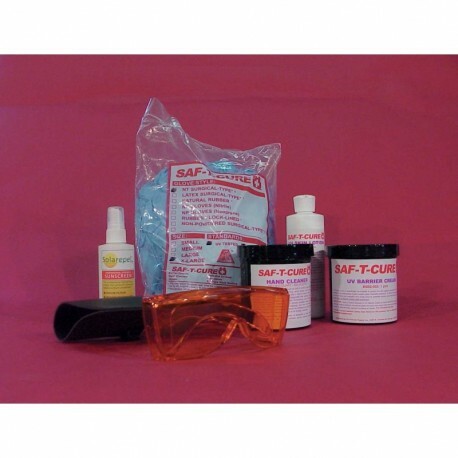 SAF-T-CURE® SAFETY STARTER KITS contain protective skin products vital in a safe and comfortable work environment. This kit is an excellent introduction to our full line of UV skin care products. Whether you are a novice or experienced in UV processes, a Safety Starter Kit will serve your needs and exceed your expectations. UV Safety Kit Plus also includes Orange UV Filter Glasses and UV Sunscreen. Protect your workers against hazardous UV with proper eye protection. Our SAFE-T-CURE Orange UV Filter Glasses provide the best protection against UV exposure up to 400nm, and against "blue light" between 400 and 510nm. Blue light can cause eye irritation and damage especially when taking photosensitizing medications. Our Orange UV Filter Glasses meet OSHA requirements and ANSI-Z87.1.